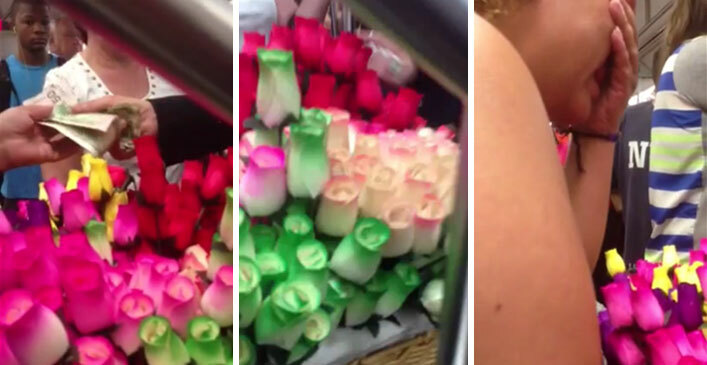 A woman selling flowers in a New York City subway was left in tears when a man gave her $140 to buy all of her roses. A video that recently went viral shows the woman informing the man that her roses are a dollar each. The man then pulls out a stack of cash to buy all of the roses. “It’d be $140 for everything?” the man asked, leaving her stunned. Instead of taking the roses with him, he instructed her to give all of them away for free. “Are you serious?” the woman asked as he handed her the money. The woman was clearly overwhelmed by the gesture and began to cry. “Free roses!” she shouted through the tears. Although the video is from 2013, it was just recently posted to Reddit and is now going viral. “I want to believe this guy made one lady’s day brighter and she in turn made about 150 people’s day brighter. Potentially more if those 150 people passed that rose on to a loved one. That is a lot of brightness for a mere $140,” says Reddit user Buster-_-Cherry.